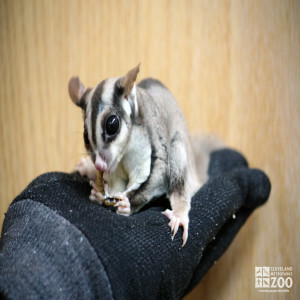 The range of the sugar glider is Australia and New Guinea. Sugar gliders inhabit forests supporting a mixture of stringybark, box, ironbark and gum eucalypts. Sugar gliders exhibit a complex social system, which varies somewhat according to the type habitat in which they live. The basic social unit consists of 2 to 7 adults (typically 5 to 7) – 2 or 3 adult males and 3 or 4 adult females. Group members share a tree hollow in which they build a spherical or bowl-shaped nest of eucalpyt leaves, but they generally forage alone at night. Group membership is closed to outsiders unless a vacancy is created by the death of a member. The dominant male in each group marks other group members with secretions from his head and chest scent glands. There are a variety of calls, including a loud bark or ‘yip’, and a rolling ‘starter motor’ anger call. Juveniles make a hiss when threatened, and will be assisted by any adult member of the same group. They avoid activity in very cold, wet weather by entering a state of torpor, or remaining huddled together in the nest. Virtually all adult sugar glider females breed each year, giving birth between June and January – mostly between August and October. Gestation period is appx. 16 to 21 days.Females have an estrus cycle of about 29 days. The young remain in the pouch for about 70 days, followed by 50 days as nestlings, and are independently active at about 4 months. Invertebrates, acacia gum, eucalyptus sap, nectar & pollen, manna and honeydew. Primate Diet + chopped fruit & vegetables. Mealworms as a treat.